Yesterday, after 17 years, we said farewell to some of our original stallholders. Sue and Ian from Lane Farm and Pam from St Margaret’s Catering both joined our market back when we started in 2000. Lots has changed since then but our friendly and approachable stallholders have always remained the backbone of our farmers market. We wish them all the best for the future and some well earned respite and relaxation! Fear not, Lane Farm’s products will be available at the next two markets and we’ve got Friends Farm lined up to join us when they finish. At the next market on 3rd June we’ll also be joined by Lucy’s cake stall, Joaquim the Artisan Pastry Chef, Shuck brewery with their local ale and Venison from Graham. Fritton Owl Sanctuary will also be back with their beautiful feathered friends! Congratulations to Carol the winner of our new raffle, she won all these goodies for only 50p!! You can win a varied selection of market products just like this at every market (drawn at 12:30). Could it be your lucky day? Yesterdays market was all about green fingers and gorgeous herbs… We had a ‘test yourself’ herb quiz, demonstration on infusing oils and celebrated ‘Georges Gorgeous Gardens’ as our producer of the Month. George’s Gorgeous Gardens have been attending other markets for the last five years and joined us at Beccles Farmers Market last year. He usually attends every market from March up until around Christmas. He is a horticulturalist who only uses natural pesticides and sells many different varieties of plants. In particular he specialises in house plants and herbs – because we all love happy healthy plants! 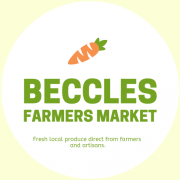 Our next Market on the 3rd June has loads of new stallholders and will be celebrating the Terrific Terrines from Blackbird Cottage Foods as our next ‘Producer of the Market’. Don’t forget you can pre-book a range of market products and more online through our new Food Assembly project.